Generate and validate checksums with ease. 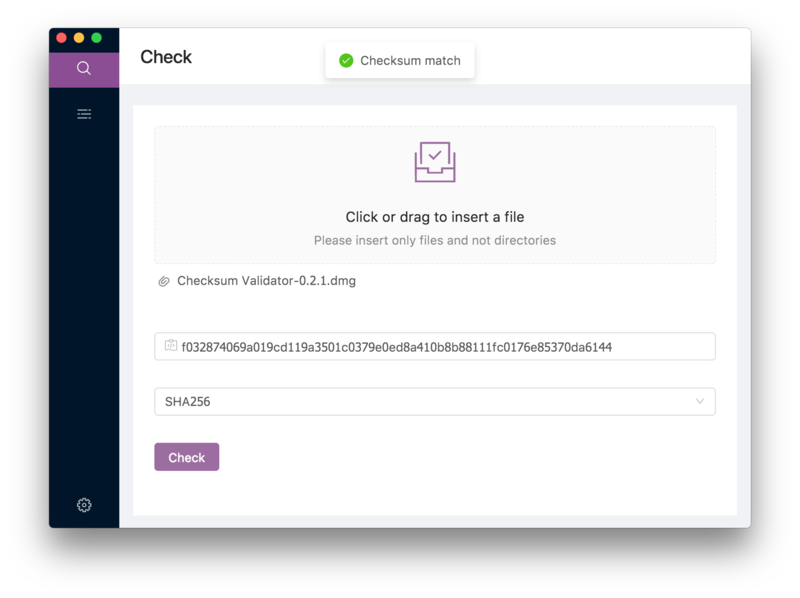 checksum-validator is a small convenient Electron application, which can quickly calculate hashes of files. It is primarily intended to validate checksums of downloaded files. Unfortunately the update to MacOS Mojave broke the build version 1.1.5. If you encounter the problem that the application will not start on Mac OS Mojave with version 1.1.5 consider downloading version 1.1.6 from the releases section. All of your settings should be preserved. Head over to the releases section and download the latest distribution. After installing it you are ready to use checksum-validator. 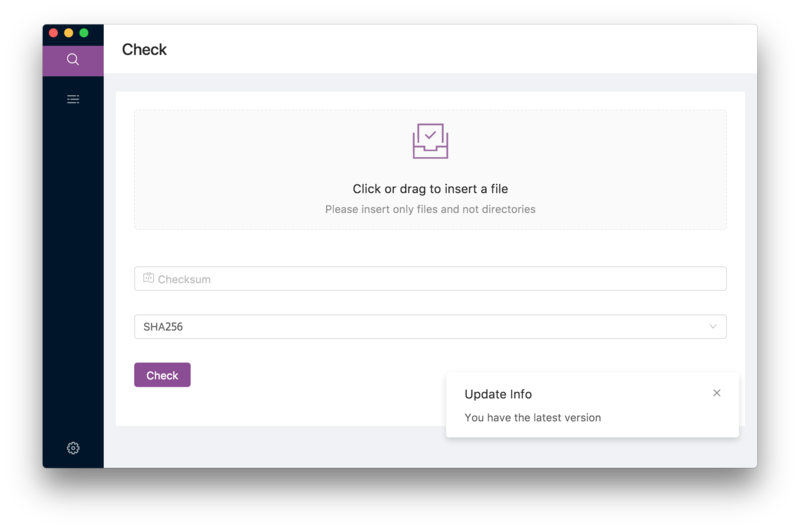 To calculate and validate the checksum of files, head over to the Check pane and either drag and drop four file into the drag area or select it by clicking on it. 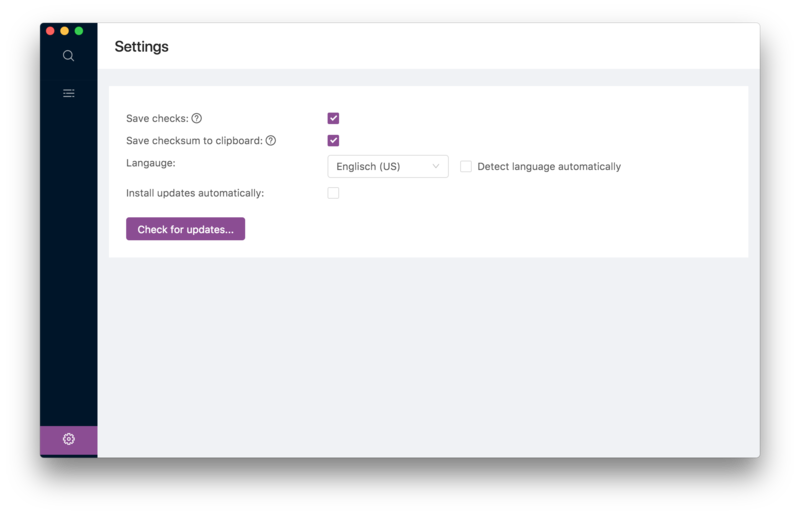 Then just type in the checksum you want to validate and select the hash algorithm which was used to generate the checksum. On the Past Checks pane you have the opportunity to have a look at all checksums you have validated so far. Furthermore you can export the checked file as .json and take a look at other hashes of the file. How was it built ? This project is only possible with these awesome technologies ! If you find any bugs or issues with this application feel free to report them in the issue section. In case you want to do some local debugging, open the logs via Help --> Open Logs and take a look at it.